Scientists have reported the discovery of the Criegee Biradical. Criegee Biradicals are formed from a chemical reaction between ozone and alkenes in the atmosphere. Alkenes are chemical compounds which are mostly released by plants. Although these chemical intermediates were hypothesised in the 1950s, it is only now that they have been detected. They are named after Rudolf Criegee, a German chemist, who first proposed the mechanism involved. To understand a Criegee biradical, it is best to define what a biradical is. A biradical in organic chemistry is an even-electron chemical compound or molecule with two free radical centres (unpaired electrons) which act independently of each other. Free radicals are mostly produced in the atmosphere from the photodissociation or breakdown-by-photons of more stable species. Their subsequent chemistry is central to such environmental issues as stratospheric ozone depletion and tropospheric oxidant production. The scientists from The University of Manchester, The University of Bristol and Sandia National Laboratories report the potentially revolutionary effects of Criegee biradicals. The paper is published in the journal Science. These invisible chemical intermediates are powerful oxidisers of pollutants such as nitrogen dioxide and sulfur dioxide, produced by combustion, and can naturally clean up the atmosphere. Scientists now believe that, with further research, these could play a major role in off-setting climate change. 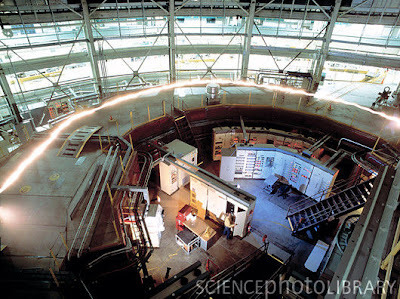 The detection of the Criegee biradical and measurement of how fast it reacts was made possible by a unique apparatus, designed by Sandia researchers, that uses light from a third-generation synchrotron facility, at the Lawrence Berkeley National Laboratory's Advanced Light Source. The intense, tunable light from the synchrotron allowed researchers to discern the formation and removal of different isomeric species – molecules that contain the same atoms but arranged in different combinations. The synchrotron uses accelerated particles (electrons) creating light. The electrons generated are high energy particles travelling close to the speed of light. The researchers then observe the interaction between the light and the chemical species that they are studying. The researchers found that the Criegee biradicals react more rapidly than first thought and will accelerate the formation of sulphate and nitrate in the atmosphere. These compounds will lead to aerosol formation and ultimately to cloud formation with the potential to cool the planet. In the last 100 years, Earth's average surface temperature increased by about 0.8 °C with about two thirds of the increase occurring over just the last three decades. Most countries have agreed that drastic cuts in greenhouse gas emissions are required, and that future global warming should be limited to below 2.0 °C (3.6 °F). Dr Carl Percival, Reader in Atmospheric Chemistry at The University of Manchester and one of the authors of the paper, believes there could be significant research possibilities arising from the discovery of the Criegee biradicals. He said: "Criegee radicals have been impossible to measure until this work carried out at the Advanced Light Source. We have been able to quantify how fast Criegee radicals react for the first time. "Our results will have a significant impact on our understanding of the oxidising capacity of the atmosphere and have wide ranging implications for pollution and climate change. "The main source of these Criegee biradicals does not depend on sunlight and so these processes take place throughout the day and night."